Rich, concentrated and silky - Cabernet Sauvignon at its finest! We harvested the fruit for this release from a single vineyard in front of the winery. The five acre vineyard was planted to Clone 337 in 1995-1998 and produces small berries with intense color, rich flavors and incredible concentration. Winemaker Kevin Hall says: "this is one of my favorite blocks of Cabernet Sauvignon on the property". The western drought continued in 2015 and was once again a topic of much discussion. A cool spring, rain at bloom and hot July along with the continued effects from the lack of rain contributed to lower yields. As a result the grapes had superb fruit flavors at harvest. After harvest this lot was de-stemmed, fermented and then aged in new French oak barrels for 26 months. Aromas of cassis, black cherry, oak, vanilla, chocolate, dark fruits and a hint of menthol fill the glass. This is a smooth wine with flavors of dark fruit, cassis, vanilla and chocolate. 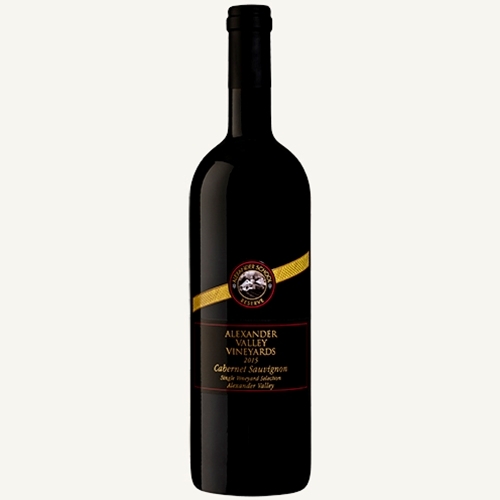 It is silky with well integrated tannins and flavors that linger for a long time, giving you the chance to reflect on the history and tradition of Alexander Valley Vineyards and Cabernet Sauvignon.